Starting a website to sell your handmade products is a brave but very rewarding process if you can truly be your own boss. E-commerce has allowed thousands of online entrepreneurs and cottage industries to make money online with minimal start up costs. Years ago starting a sewing business meant early mornings at expensive market stalls, or even negotiating for space in shops. Starting small is never easy, but thanks to online tools like Etsy, Ebay and Shopify, you can start with no inventory and minimal costs so you can test the market. If your product doesn’t sell, no problem. You haven’t invested too much of your time or money and you can test other ideas until you can successfully make money online through being your own boss. Never start a business by getting over-confident and investing in lots of expensive equipment. 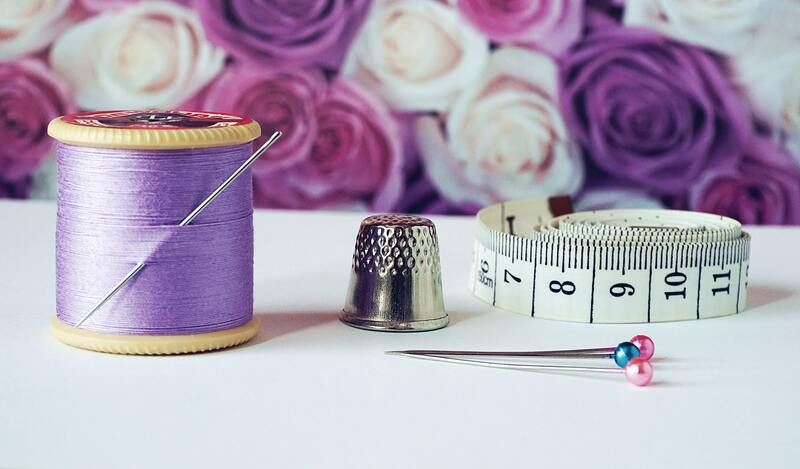 Hopefully you should already have a good sewing machine or embroidery machine if your business idea is textile-based but if not shop around to get the best sewing machine deals. Materials should take up most of your budget but again try to keep this to a minimum especially during testing. When you know what is selling well you can look into bulk-buying materials. Fabric.com offers a business program that means you can buy cheap fabric for a discount if you register as a business seller. For UK sewists, the Minerva Crafts Club offers a 10% discount on fabric purchases. If E-commerce is going to be the focus of your business then it obviously makes sense to invest in good tech. You might not need the latest Macbook, but a reasonable laptop or iPad will go a long way in making sure you’re not stalled by waiting for your browser to load. Starting an e-commerce site without experience is not as difficult as it sounds. The quickest option is to sign up for a website builder like Shopify. On the other hand, you may just want to try out a few products on Etsy. Some 500,000 Shopify sellers pay a monthly subscription in addition to a small fee per purchase. The basic Shopify plan costs $29 per month, plus 2.9% and 30 cents per transaction. Lauren Stowell of American Duchess started her 18th Century shoes brand when she sold a pair of reproduction Victorian boots on Etsy in seconds of listing them. Now, she runs a global empire supplying reenactors and costumers with accurate historical shoes. Shopify is an easy out-of-the-box solution to start your online shop. With Shopify’s ecommerce software, you get one unified platform to run your business with ease. Fully customize your online store, add new sales channels in seconds and manage unlimited products and inventory fulfill orders in a single step. You can even track sales and growth trends to see what are your most profitable products and where you should invest more. Why Build a Website With Wix? Since its launch in 2006 Wix has powered 109 million websites. That is compared to just 40 million on Weebly and 1 million on Squarespace. Why does that matter? That is a huge number of individual customers with their own requirements. Read our full Wix review here. Those apps from the marketplace get downloaded thousands of times. That means updates and bugs are dealt with fast while Wix keeps ahead of the game to satisfy so many customers as technology progresses and changes. They even use an Artificial Intelligence Design system to create the best-looking website for you automatically. It would be wrong for us not to say WordPress is one of the best website builders around. Afterall, WordPress powers The Costume Rag! We recommend the best Ecommerce plugin Woocommerce to turn your website into a profitable online shop. The biggest question for every new website is how to get traffic. This can be an extremely frustrating part of starting a business as hours of work seem to go nowhere because no one is visiting your website. A quick solution can be posting to social media. Crowdfire is an app that allows you to passively post on your social feeds by scheduling social media posts in advance. It is even programmed to learn what times are best to post on social media to get the most traffic and engagement. Simply tap the content you want to post and it will be scheduled to post at the best time. However, social media is great but how do you get traffic from Google? The answer is Search Engine Optimisation, or SEO. This is all about how you construct your site and plan your content. Starting a blog is the first step to building serious traffic on your website. By targeting relevant keywords you can make sure the right people discover your e-commerce site. If you’re ready to seriously boost your SEO and get to the top of Google, SEMRush is arguably the best SEO tool on the market. SEMRush has access to the Google database and can tell you everything you need to know about your search presence and how to get more traffic. Don’t think you’ll be able to produce the right content? Finding someone to help is easy. Fiverr offers freelance services for budding entrepreneurs and has a wealth of expertise on SEO and content writing for very reasonable prices. If you want to make more money online then you may consider supporting your site with affiliate links. When your website and social feeds have decent traffic you can promote products with custom links that mean you make a commission if the product sells. We find the best affiliate programs to make money online are Awin and the Skimlinks Affiliate Network.